LapBaby is a comfortable seating aid designed to secure a baby on your lap leaving both hands free. 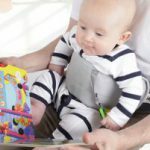 Simple, practical and easy to use, you no longer have to hold your baby with one arm restricting what you can do together. LapBaby’s design allows you to keep natural close contact with your baby and carry on with your everyday activities.. 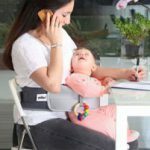 Designed in the UK, LapBaby is a hands-free belt that comfortably secures a baby in an adults’ lap leaving both hands free to eat, work, read/wean/play with baby or engage with another child. Suitable for use from around 3 months old (before high chair age), or as soon as baby can support their own head. LapBaby is soft and gentle on your baby’s sensitive skin, made from materials that are free from harmful chemicals and allergens. LapBaby aids early childhood development activities – you can easily read, paint, build blocks, even play the piano with 2 hands. Baby is facing forwards exploring the world around them and can join in as they grow and develop. Product features include an extendable and detachable wipe-clean lap cloth for those messy moments, plus a fabric clip to attach a toy, teether or soother – baby can keep their favourite toy close and not drop it on the floor. What is the minimum/maximum age for using Lapbaby? LapBaby can be used from 3 months or as soon as baby can support his/her own head and can continue to be used for as long as they’re happy to sit on your lap. What is the maximum adult waist size that will fit LapBaby? The maximum adult waist size is 44 inches / 115cm, both adult and baby belts are adjustable.